In order to create ultramarine blue surfaces of similar color purity as Yves Klein, we have made several tests to achieve a matt finish. 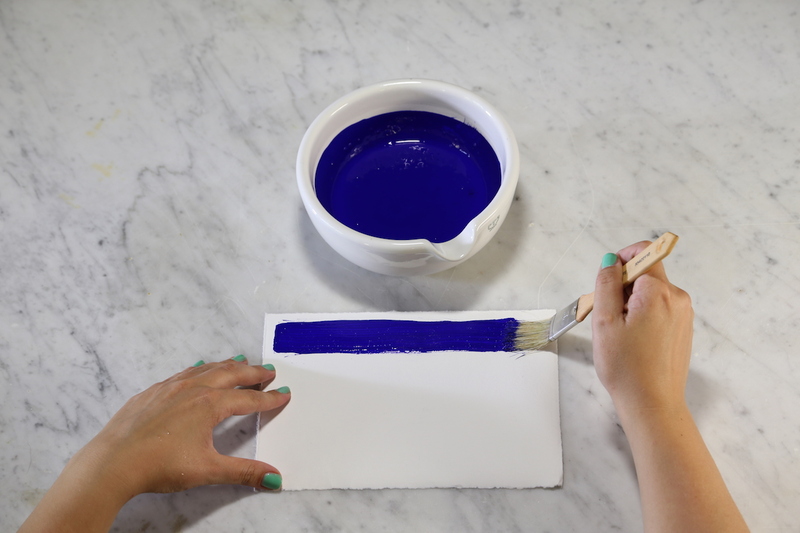 We tested different varieties of ultramarine blue. With our Ultramarine Blue, very dark (#45000), and our Ultramarine Blue, dark (#45010), we were able to achieve a comparable color purity and a similarly matt finish. We used a mixture of Cellulose Glue K 1000 (#63310) and Disperion K 9 (#75367). 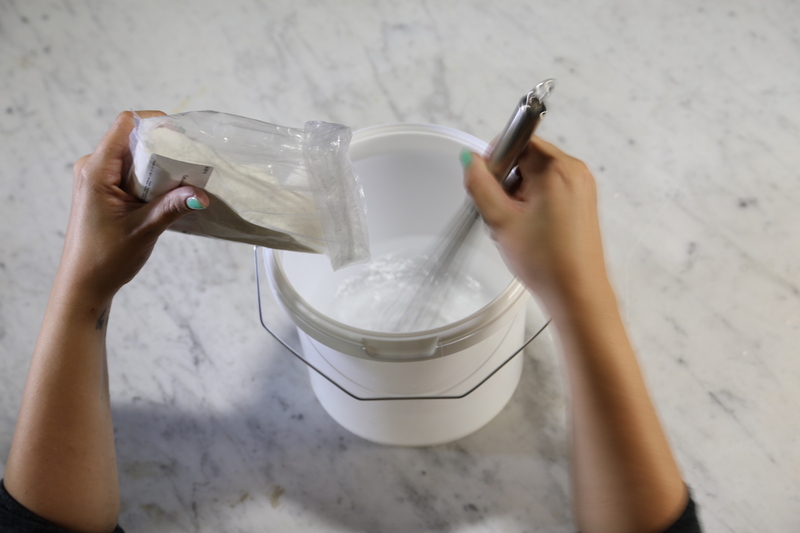 Dissolve 40 g of Cellulose glue in 1 liter of cold, boiled water, stirring all the time. Keep stirring until the glue is well dispersed in the water, so that it does not float, and no lumps remain. Leth the mixture sit overnight to swell. 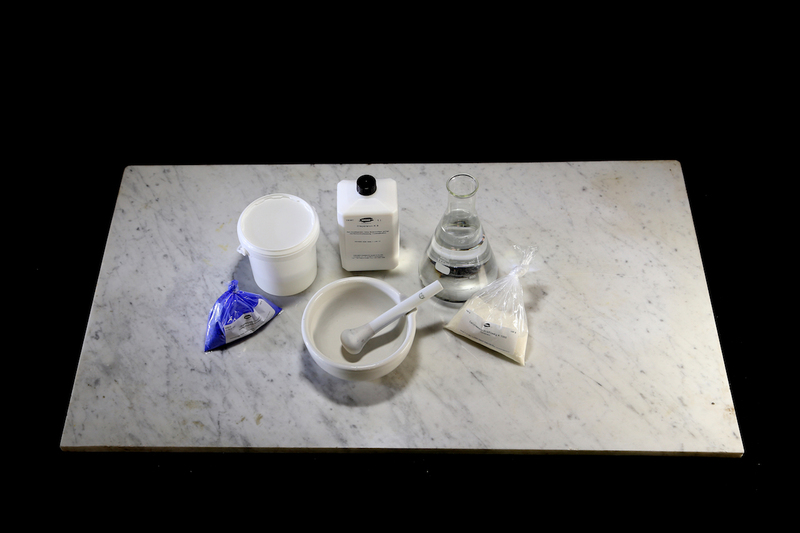 Mix the glue solution with Dispersion K 9 (#75367) with a mixing ratio of 1:1. Soak 40 grams of Ultramarine Blue, very dark (#45000), or 30 grams of Ultramarine blue, dark (#45010), with water and add 20 grams of the binding mixture. 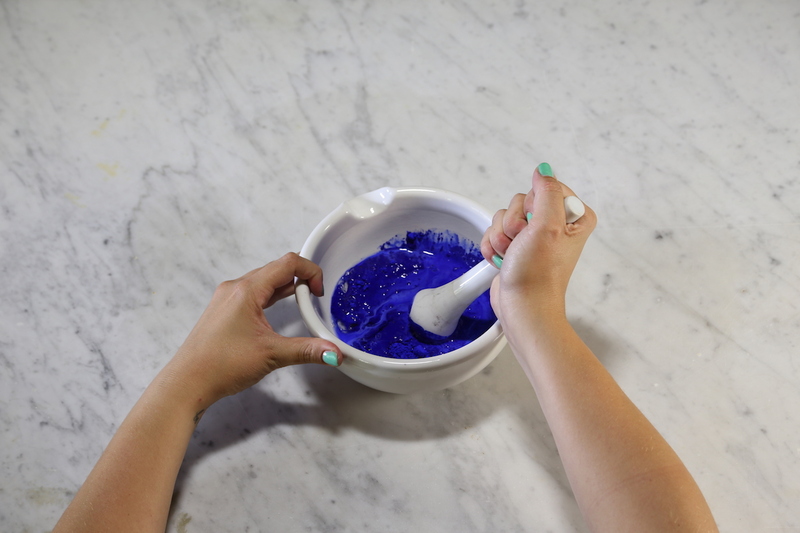 With both pigments, this method will result in surfaces with a matt finish. Apply the paint in a thin and evenly spread layer. Every additional coat will intensify the matt finish, but reduce the abrasion resistance of the paint. After the forth or fifth coat, the surface will show chalking. If you use other pigments than the ones listed above, the mixing ratio may be different and abrasion resistance should be tested prior to application. The finer the pigment, the more binding medium is required in order to avoid chalking. Once the suitable mixture and mixing ratio of acrylic dispersion, cellulose glue, water and pigment is found you can achieve the desired matt finish with most pigments.